ALERT: There are now five History of Gear books published. They cover three of the earliest gear pioneers, GERRY MOUNTAIN SPORTS, HOLUBAR MOUNTAINEERING, and WARMLITE EQUIPMENT, plus two somewhat later companies, FROSTLINE KITS and Mountain Safety Research (MSR) of Seattle... If interested, the books can all be ordered direct from my publisher. Click here to learn more (oldgear@oregonphotos.com). 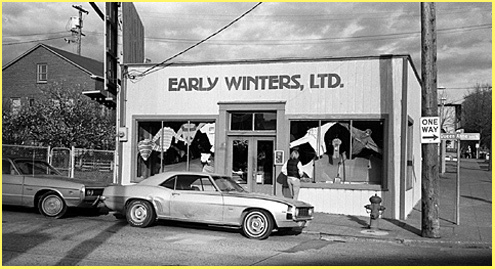 BILL NICOLAI is the man behind the classic Early Winters company, which began in 1972 (William S. Nicolai), and ended its classic phase in the early 1980s when it dropped its classic products, eg. its wonderful tents and mountain parkas. This company has something of a "fan following," several have claimed, including David Jensen, formerly in Customer Service for the company, that EW produced the first commercially available Goretex piece of outdoor gear, a Mountain Parka in 1976. Others, like Peter Hickner, the founder of nearby Feathered Friends, remember it differently saying that Goretex tent fabric came first and thus the Light Dimension tent was the first Goretex creation, followed by Goretex garments later when that type of Goretex fabric became available....(link to inventors of Goretex )....Mr. Jensen also states that the company's second Goretex product followed about six months later. That was a tent, the Light Dimension, also in 1976..Thus, it seems very plausible to claim that Early Winters ought to have two honors in the History of Gear-- FIRST GORETEX GARMENT, and FIRST GORETEX TENT. (although, as I have noted, which came first and which came second is not clear).....ABOVE: This 1978 picture shows the original EW store, which one of my correspondents remembers as "incredibly fun and charming." It was in the old Alpine Guild store on Queen Anne Hill near Seattle Center. The street sign says "Queen Anne Ave. N.," the street number was 300, and the town of course is Seattle, Washington. The storefront picture is compliments of a correspondent, who also reports that at the time of the Queen Ave. store Mr. Nicolai had a man named Bill Edwards as his partner.. The third original partner, Mr. Ron Zimmerman, contacted me also. Please Note: All Material on this page, and in all my "History of Gear" webpages, is copyrighted, and no usage of my material is permitted unless explicit permission is granted by me, Bruce B. Johnson, owner of OregonPhotos.com...... Editors: Please contact me if you have interest in publishing....Others: if you were involved with one of the old-line, vintage gear companies and have a story to tell in these pages, please contact me soon (oldgear@oregonphotos.com).uill Nickolai is a spelling also seen. There are those who remember EW's earliest tents with great admiration and fondness. The first to be introduced was in 1972, a radically-styled, expedition-capable tent named the "Omnipotent." In the picture at page top, one can glimpse an Omnipotent on the right side of the display window. Later, in 1976, came the Goretex "Light Dimension." Sadly, sometime in the early 1980s, the Company dropped all its fine tents and mountain parkas from its catalogs (my 1983 catalog verifies this, and also shows that the company was still located in Seattle (110 Prefontaine Place South, Seattle, 98104). .... The Omnipotent was a non-Goretex, extreme-weather tent designed by Mr. Nicolai. It was a hoop style tent with four supporting poles, and also featured a double-wall design wherein the outer shell of the tent was its strength and waterproofing, and the inner tent was permanently attached to the outer and more or less suspended from the outer shell--- in some ways similar to what Warmlite tents had been doing for many years. The Omnipotent arose reputedly after the failure of Mr. Nicolai's traditional A-frame tent circa 1970 nearly led to his death on Early Winters Spire in the North Cascades of Washington State...He was a poor young man then, but his innovative direct marketing through catalogs grew his small company quickly.. By 1976, he introduced The Light Dimension, a single-wall Goretex design that some claim was a FIRST in the industry. Tent Image credit: Alan Wenker. If claims are true, then Early Winters company would merit a HISTORY OF GEAR AWARD, and that would be: DOUBLE FIRSTS-- FIRST TO USE GORETEX IN A GARMENT, and FIRST TO USE GORETEX IN A TENT, both in 1976. A bit later, in 1978, EW introduced a 3-4 man Goretex geodesic dome designed by tent designer Bob Howe (see link). It was named the "Earth Station." It was likely the first true geodesic dome tent to use a single-wall Goretex shell. for more on EW tents, see Page Two! For a page specific to the famed Omnipotent, see Page Three! 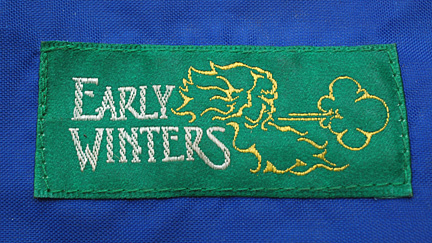 Early Winters as its original innovative self was gone by about 1983, when it had discontinued its very successful line of tents and other "serious" mountain gear..... My guess is that the persistence of the Early Winters label into relatively recent times reflects the fact that it was a successful label and its later corporate owners desired to maintain its draw. . I would highly appreciate READER INPUT ABOUT Early Winters. ...CONTACT ME.... Wikipedia also has a biography of sorts about Mr. Nicolai. Here is the link to that.... in part, the biography states that after Mr. Nicolai sold Early Winters he went on to other pursuits, primarily in the area of being a consultant about direct marketing catalog sales. It states that as of 2007 he was still alive and was still in the area of business consulting.... It adds information about the person of Mr. N., stating that he was a long-term sailplane pilot, and also a person who did quite a few climbing and skiing exploits, thus that he was a person authentically grounded in moutain pursuits on a personal level.... Other research I have done reveal that Mr. Nicolai possesses a graduate degree in Business from Harvard, so this man has what so many of the pioneers of gear lacked, which was highly trained business skills. Without such skills to guide them through changing times, many of the great classic companies were destroyed--- beset with new challenges like competition from China.... Dec. 2010, a recent reader contribution places Mr. Nicolai as a senior staff at Lenser.com; this company also has a biography posted in their "Staff" pages. The "Early Winters" name was apparently bought and is now owned, and maybe used, by Norm Thompson. Remarkably different has been the business course of the small custom gearmaker Stephenson's Warmlite, which has survived, and never changed its name or ownership in some 40 years of doing business! Be sure to examine the Warmlite tents, which possess a basic design/structure remarkably like the Light Dimension and Omnipotent, but had already been on the market over ten years when the EW line was introduced. Main Page: Essays and pictures about the Pioneers of the Outdoor Gear Revolution, 1935-The Present, 45+ pages, six history of gear books published, and still-growing! Rivendell Bombshelter Tent, circa 1974, still the strongest tent ever made?